MISHAWAKA – Everyone has been there before. Sitting next to the Christmas tree on Christmas morning, staring at that box that isn’t quite a normal size. It’s labeled to you, you want to open it, but it’s buried behind some other stuff. So you look at it, try to figure it out, wonder who it’s from. Was it on my list? What did I ask for that would fit in that box? I want to know what it is! Then you finally get your turn around the circle, and open the box and it’s a really cool gadget or jacket that you didn’t ask for, but really piques your curiosity. Part of me felt that was last Wednesday as I sat in the Wawasee High School annex gym watching my daughter take part in gymnastics camp. I was right in the middle of Northern Lakes Conference country, staring at my Twitter screen telling me about the biggest news to hit the conference in years. Well, unless you ask the grizzled residents of Goshen, who still have their Redskins sweatshirts in rotation ready for pumpkin huntin’ at Kerchers. So with the addition of Mishawaka in two years when Elkhart Memorial and merges with Elkhart Central into an Optimus Prime and heads to the NIC, how does that spin for the NLC? Did the conference get it right? Or did they have a choice? If you ask around, no one is really saying much about it from an administrative standpoint. NLC leader Larry Kissinger didn’t return response as the announcement made the rounds Wednesday morning, just putting out a Tweet welcoming Mishawaka into the fold and retweeting the announcement Mishawaka made on its socials. The Cavemen were even more tight-lipped. Aside from their formal announcement made to the media, both principal Jerome Calderone and athletic director Dean Huppert both have been mostly silent. The athletic staff at MHS was asked to do the same. Memorial’s rumbles of merging with Central a few years ago, and the subsequent formals of doing so, put into motion one of the best water cooler conversation items the NLC could generate. Before Mishawaka stepped forward and filled the pending void, seemingly everyone had their say in who it might be. “Fantasy NLC quarterback” had all sorts of destined suitors, but all had some sort of wart. Columbia City fit the size bill, but is too far of a drive for most of Elkhart County. Fairfield is the logical fit for logistics, but they don’t have soccer or swimming. In the NLC, that matters. Tippecanoe Valley was tossed out there as a possible tie-in with Rochester a few years ago, but Valley would be up against it in a lot of sports like swimming, soccer, tennis and golf where the NLC generally is strong. 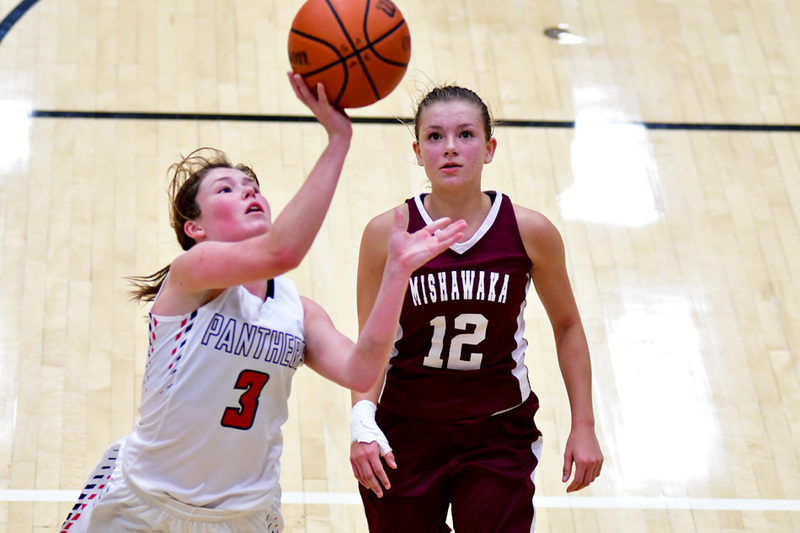 Mishawaka Marian is the square I put my dollar, as they are state-level elite in over half of their sports. Was Marian’s size (610) and connection to St. Joe just too much? New Prairie was rumored to be the other institution to file for acceptance, but it also had a pair of glaring red flags. The drive to New Carlisle would be one that both Northridge and Wawasee would likely not travel well for, and the other small detail that New Carlisle is in the Central Time Zone, pushing games back an hour. Tuesday night tennis and overtime basketball would be nightmare scenarios, especially winter sports with possible snow flying around. Other schools had been tossed out there like Lakeland, West Noble, Jimtown, Bremen and Rochester, but at the end of the day, the NLC will get Mishawaka. The drive to the Cave and Baker Park – the offsite park where Mishawaka plays its baseball, softball, soccer and tennis – will still set some fanbases back about an hour in the car, but here is what the Cavemen offer for those who don’t know much about them. Mishawaka – checking in at 1,470 students in the last census – will immediately up the ante in football and wrestling, its two signature sports. Bart Curtis, Warsaw’s new football head coach, will likely have a statue made of him at Mishawaka before it’s all said and done because he did the one thing Jim Aldrich couldn’t. He beat Penn. If Warsaw ever wants to beat Penn in the sectional, Curtis is the guy who knows how. Anyways, Mishawaka has been a ranked Class 5-A and 4-A football program for several years running and its wrestling program has stood toe-to-toe with Penn for years. Just a few short years ago, Mishawaka was nationally ranked in wrestling and won two state team titles in the 2000s. Two-time national cross country champion Anna Rohrer is a Mishawaka grad and had some epic races against Warsaw running legend Ashley Erba earlier this decade. The MHS track and cross country programs have been very competitive, their softball and volleyball programs have a colorful history, and both basketball outfits have had mixed success over the last decade. The girls hoops program welcomed in new head coach Sarah DeShone this week, the sister to Concord’s new boys hoops coach Derrick DeShone. Those who follow winter sports closely also know that Mishawaka is the host for both the Al Smith Wrestling Invitational, one of the biggest individual tournaments in the state, and one of the IHSAA’s diving regionals, where Northridge and Warsaw sectionals both feed into. Likely the adjustment will be seamless, it’s just change. The bellyaching from the old guard in the Princess City will get over its 90 years of turning over the same schedule year after year. The grumpy parents in the NLC complaining about the drive will be reminded that they drive a whole lot farther all summer with their travel sports schedules and it’s only every other year they have to be the visitor. And they drive to Plymouth. And wherever else that isn’t close. Mishawaka will likely enjoy the NLC crowds better than what South Bend was not providing save for boys basketball. Even St. Joe doesn’t travel well, as evident in recent years in the state tournament where NLC opponents were overtaking their sections (re: NorthWood baseball at Plymouth and Wawasee softball at Twin Lakes). And for what it’s worth, Huppert understands promotion better than possibly any other athletic director having spent decades in TV and also coaching softball at Bremen. He’s changing the stale culture in Mishawaka, one that’s tired of being in the shadow of Penn and looking to create a new identity. And they have a shiny new football scoreboard. NLC football fans need shiny new stadium candy! And let’s be honest, University Park Mall is less than 10 minutes away. The bypass will save you a lot of time, exit at Elm Rd. and the campus is just a few minutes north and west. And Mishawaka has a Chick Fil-A. Let that sink in. They have Chick Fil-A. So let’s see what this all looks like in two years. Will it be a good move for the NLC, and for Huppert’s athletic department? For the good of the group, most will tweet ‘yes’.